Benedetto Croce is one of the most influential philosophers of the twentieth century. His work in aesthetics and historiography has been controversial, but enduring. 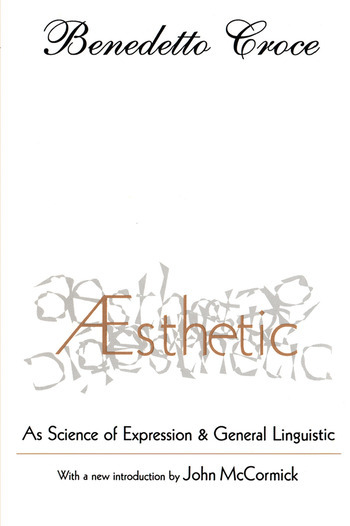 When the first edition of ^Esthetic appeared in 1902, Croce was seen as foremost in reasserting an idealistic philosophy, which despite its source in continental idealists from Descartes to Hegel, offers a system that attempts to account for the emergence of scientific systems. Croce thus combines scientific and metaphysical thought into a dynamic aesthetic. Croce regards aesthetics not merely as a branch of philosophy, but as a fundamental human activity. It is inseparable from historical, psychological, political, economic, and moral considerations, no less than a unique frame of artistic reference. Aesthetic is composed of two parts: Part One concentrates on aesthetic theory and practice. Among the topics it covers are: intuition and expression, art and philosophy, historicism and intellectualism, and beauty in nature and in art. Part Two is devoted to the history of aesthetics. Croce analyzes such subjects as: aesthetic ideas in the Middle Ages and Renaissance, Giambattista Vico as the inventor of aesthetic science, the philosophy of language, and aesthetic psychologism. In his new introduction to a classic translation, John McCormick assesses Croce's influence in aesthetic theory and historiography. He notes that the republication of this work is an overdue appreciation of a singular effort to resolve the classic questions of the philosophy of art, art for its own sake and art as a social enterprise; both find a place in Croce's system.